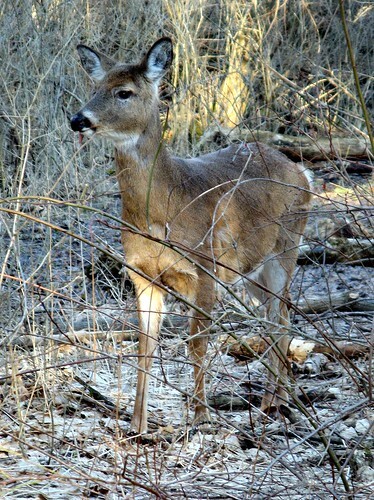 deer in the woods, originally uploaded by jahansell. An interruption in the tour of Ancramdale. I went out for a jog last night and saw, on Low Road, this deer, not fifteen feet away. It had a strange feature, which you can't see from this angle: its tongue was hanging out of the side of its mouth. I don't know if it was doing it on purpose or if it sick or injured in some way - it was quite a strange sight. It watched me as I tiptoed closer and closer, but eventually bounded away with another, larger deer that I assumed was its mother. Its very beautiful, hope it was ok. Do they normally get that close? Nice meeting with is very shy animal. It's very difficult to get so close of them. Jenny, sweet creature you came upon. What a mystery that tongue is! I hope it wasn't injured. It looks pretty good in your photo.